I hope your week has been great! We kicked off our new series "God is..." this past Sunday. We are looking at four eternal truths about God and their everyday significance. Last Sunday we looked "God is great...so I don't have to be in control." If you missed it go check it out HERE and get caught up. The truths we are looking at over the next four weeks come from a book called "You Can Change" by Tim Chester. It is a great book about changing personally through the power of the gospel. I highly recommend it. Your best bet is to order it from Amazon.com. This Sunday we will be looking at "God is glorious". This entire series is a great series to bring someone you have been praying for. Last Sunday the rain kept some away, but you guys still did a great job inviting people for "Time Change Sunday". Special thanks to all our Guest Services team for all they did for that great day! I'm looking forward to seeing you Sunday! The annual Summit is a team meeting for all those who serve in Crossbridge Kids. This is an opportunity to hear from our new Children's Minister, Jennifer Krupa, and to get invaluable training on how to lead kids to Jesus in our Sunday morning environments. Meet in the main Auditorium - you don't want to miss it! Let's share God's love in a practical way by providing food items for those in need! All donations will go to a local ministry partner, My Brother's Keeper, for their food distribution. 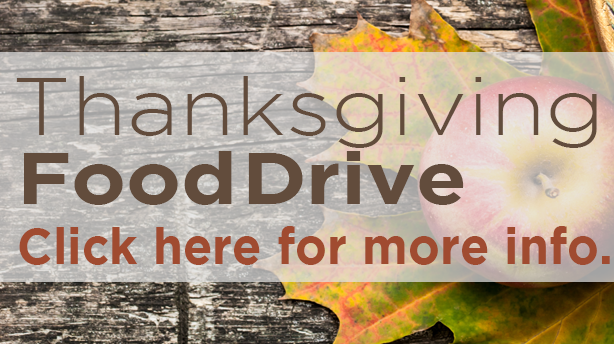 All items will be collected on Sundays, November 8th and 15th ONLY! You can get the item list by going HERE. Friday, December 4 I 6:30PM I Tickets Available Beginning this Sunday! FINANCIAL UPDATE . . .